You all may have seen on my Snaps that we made some ‘PUPcakes’ for Fitz over the weekend. 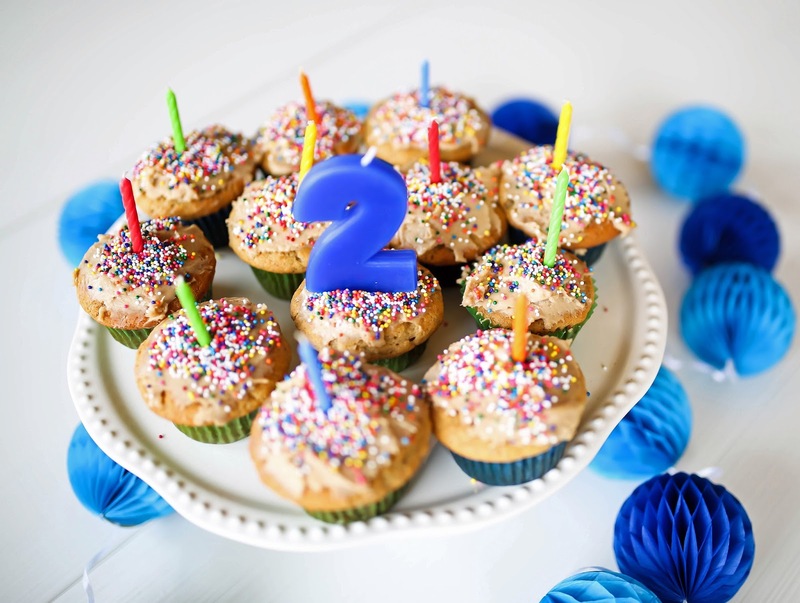 His second birthday was August 8 and yes – we are crazies and threw him a little party. No shame in our game. A little background – I am a crazy dog lover. Like, I’ll be walking down the street and ask to pet someones dog… I don’t meet a stranger when it comes to seeing someone with a dog. I had a Pinterest board where I pinned golden doodle puppies all the time when John was in medical school. He always said “no we are not getting a dog!” He is very allergic to dogs — w/exception of F1B Goldendoodles. I begged and begged for a dog and the first year of residency – just a week before my birthday John drove me to Missouri to see a breeder. We met all of the puppies that were not already ‘claimed’ – and got to pick which one we liked. I was on the floor playing with them all and John was sitting on the couch and I remember Fitz (he had a different name then!) kept going straight to John and curling up in his arms- meanwhile the rest were super playful and one was kind of a bully (but so cute!!). As soon as Fitz started snuggling John – I could see that John was quickly getting used to the idea of having a dog. It was the BEST bday present ever!! Within just a few weeks of having Fitz – John was making stops on his way home at Petsmart to surprise Fitz with new toys — it didn’t take long too become a crazy puppy lover. We are so crazy ab him – he has the most fun personality, ever. I swear he thinks he’s part human! He’s made this whole residency thing 1000x better, that’s for sure. I could go on forever and ever ab him but I will refrain! 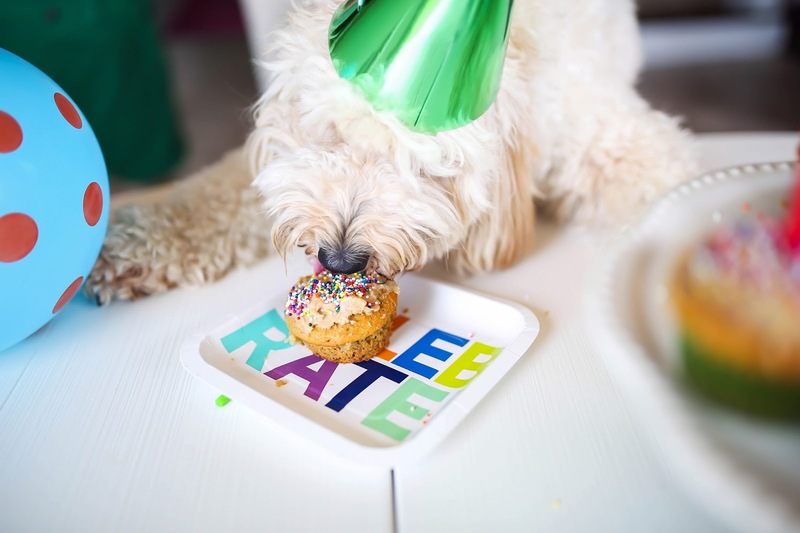 Anyway, my friend Kara has a golden doodle and they celebrated his birthday just before Fitz w/these PUPcakes so we stole the recipe for Fitzy. He is OBSESSED w/them btw! ^How they look before icing! In a mixer, beat the PB, Oil, Bananas, Honey, & Eggs until combined. 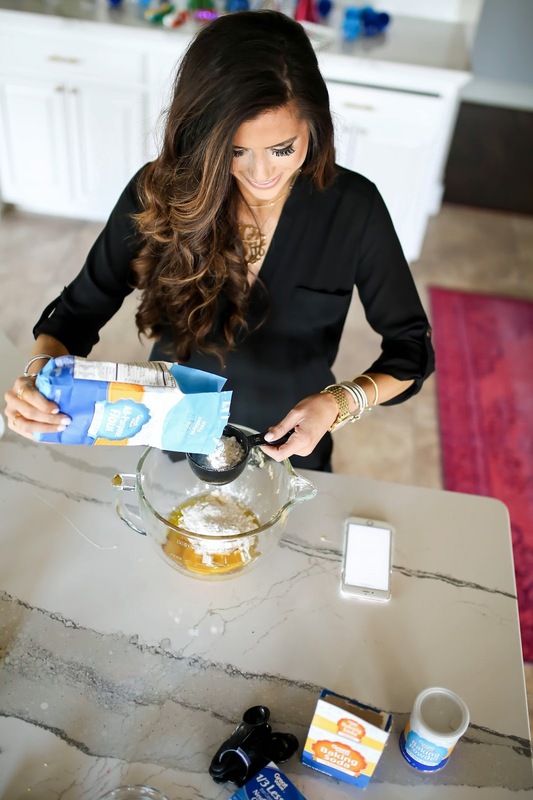 Gradually add flour, baking soda, and baking powder. 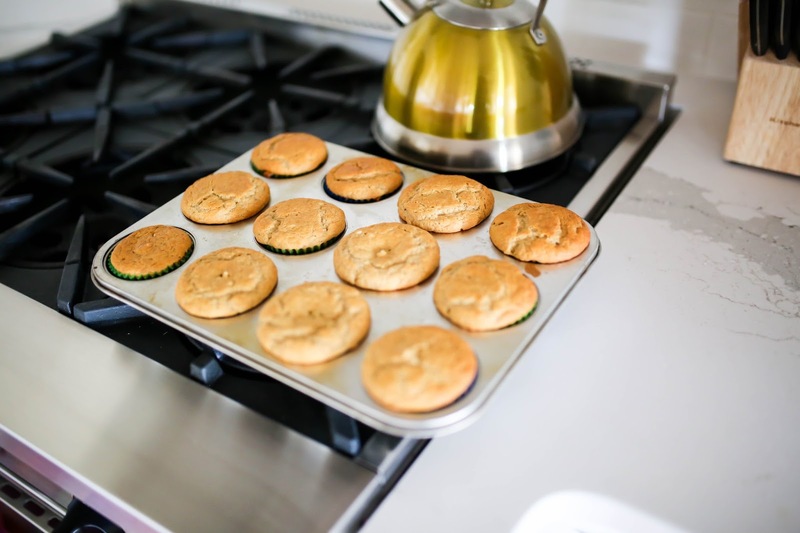 Mix well, Spoon batter into muffin tins until about 3/4 full. Combing PB, Neufchatel cheese, & milk until smooth. Spread over Pupcakes once they are cooled down. I made the Pupcakes before church & spread the icing on them after church! Disclaimer: Some dogs may have allergies os use w/caution. Consult your vet w/any questions or ingredients on this list. 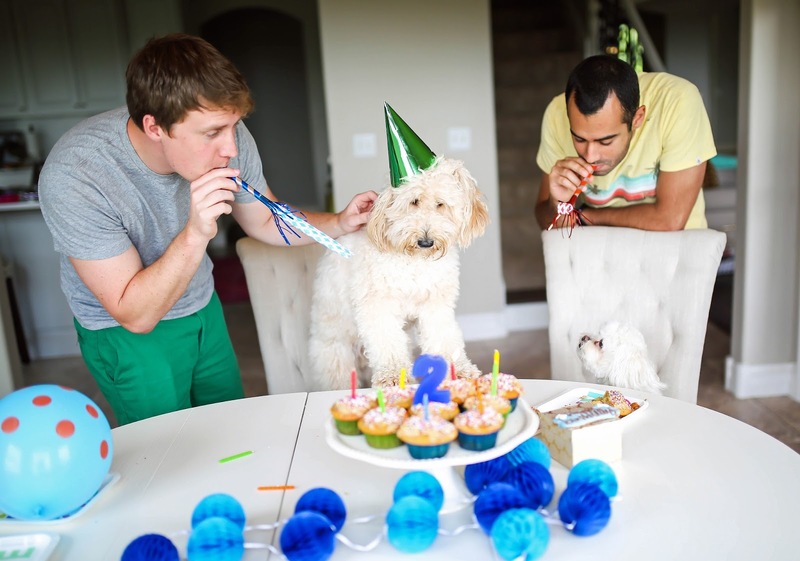 ^Marwan & Melissa & their pup Spike came over to celebrate! Spike wasn’t sure about all of this! Necklaces are HERE & HERE. Countertops are Cambria Quartz – Brittanica. Gold Kitchen Aid Mixer is HERE – from the Artisan collection in ‘Champagne’. Such cute photos! You guys look like you had so much fun with Fitz! I had a birthday party for my little cat last December and it was so much fun! Thank you for sharing! This is absolutely adorable!!! 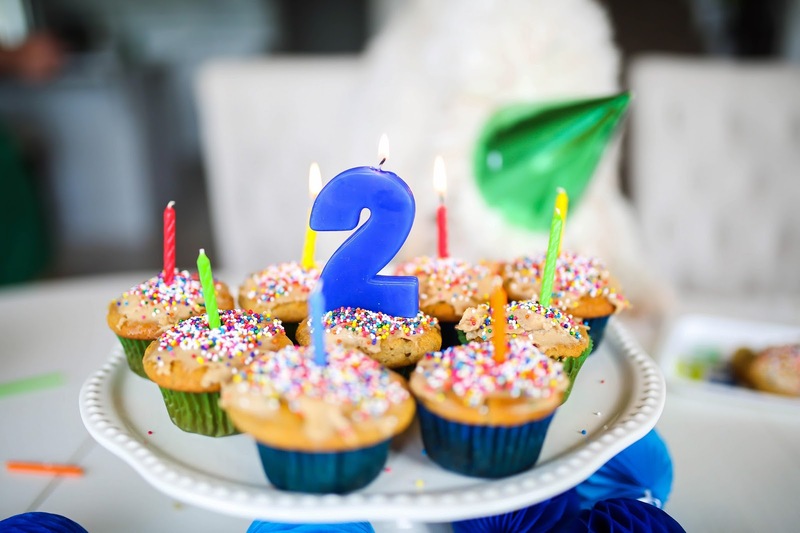 Happy 2nd birthday Fitz! Fitz is so adorable! 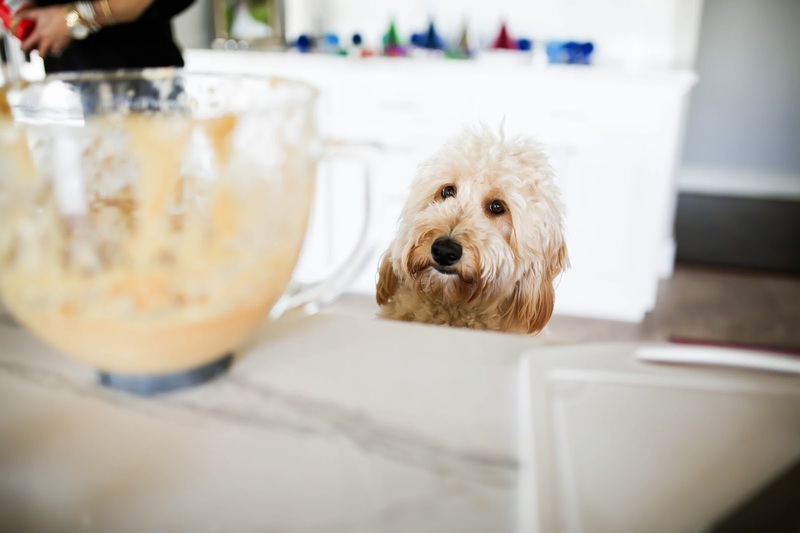 I'm a goldendoodle mom myself and I love my little Knox to the moon and back! Happy Birthday Fitz! Oh my gosh this is the cutest thing I'm practically dying! 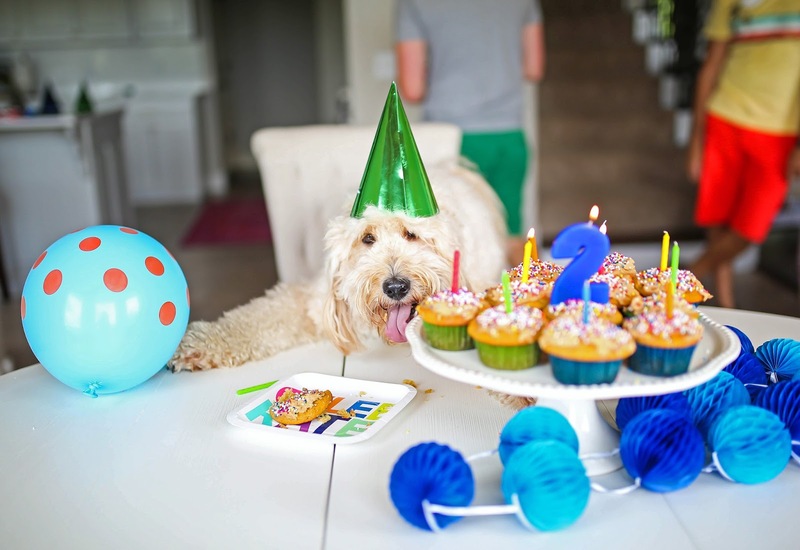 My pup Charlie turned 6 a couple months ago and I totally wanted to do something like this and you've completely inspired me (and helped so much with your recipe)! THANK YOU!!! Omg Fitz is the cutest thing ever! You guys are adorable! HBD Fitz! 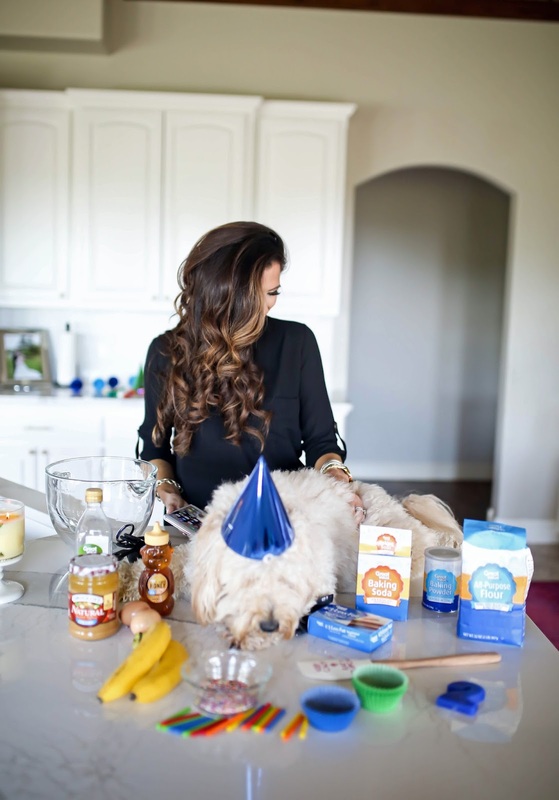 I can't wait to throw my future pup a birthday party! 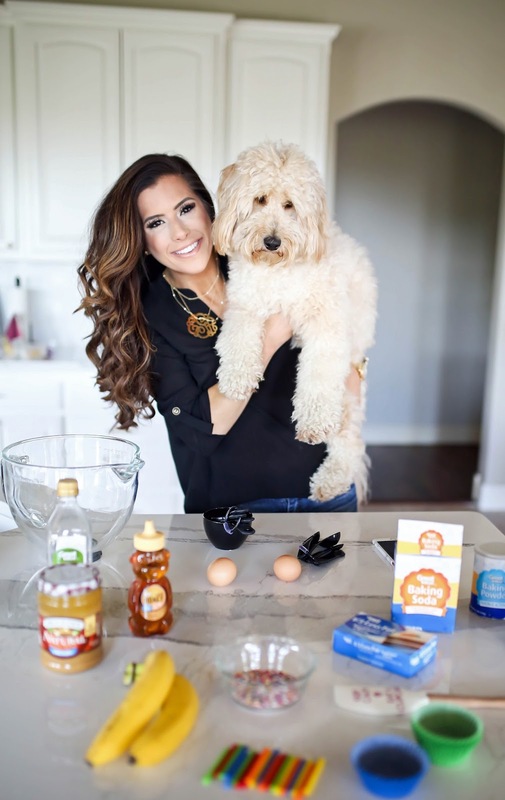 We would need a hypoallergenic dog too… I love golden doodles and mini schnauzers! Love that black tunic! Such a classic piece that can be used so many ways. And Fitz is just too adorable! Such a cute post! Happy birthday Fitz! One of my friends celebrates her dogs birthday every year as well – she made a watermellon cake and frosting which the dog was able to eat also! Happy birthday Fitz! Where did you get your super cute kitchen towels? This is so fun! I love watching all of your snaps of Fitz! Happy Birthday, Fitz! Our Lab's birthday was August 16th. 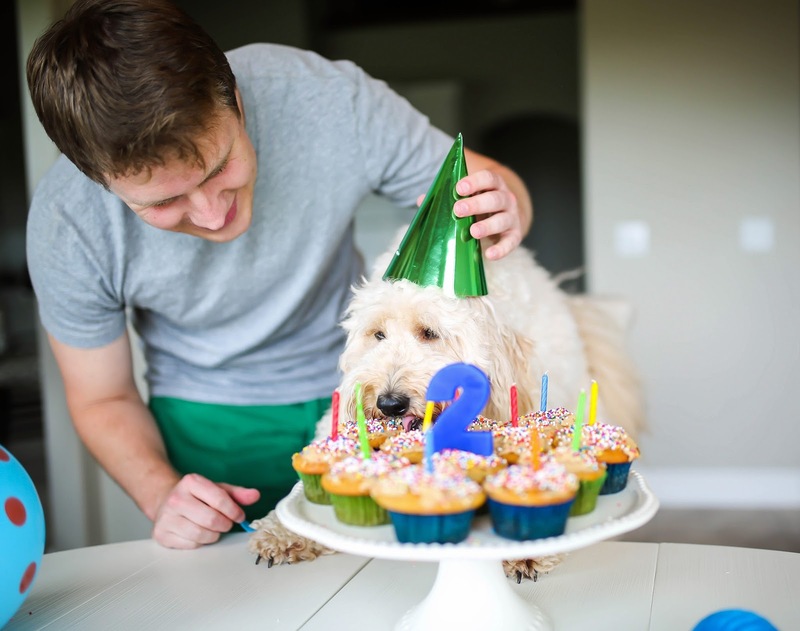 We have 2 babies now, but we still celebrate our dogs' birthday because our dogs will always be our 'firstborns.' (we have 2 dogs) haha – we grilled steak because we're pretty sure that is our dog's favorite food on the planet. Your kitchen looks beautiful! 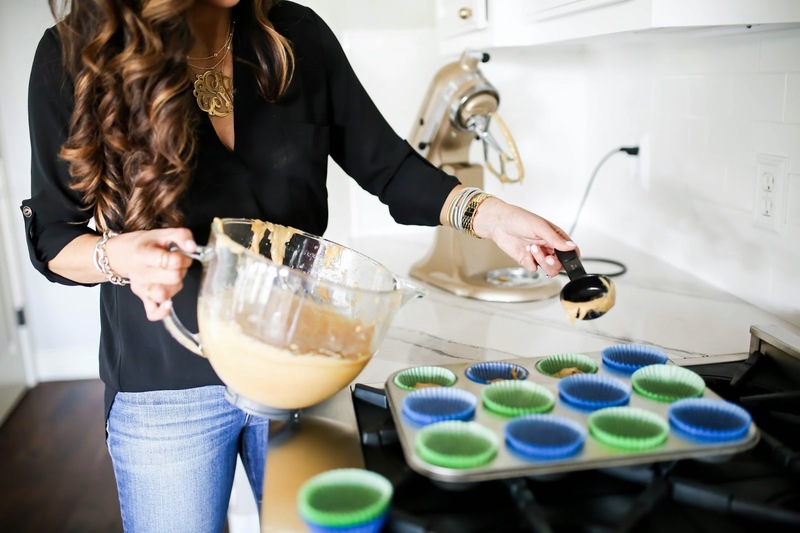 That gold kitchen aid mixer is seriously to die for! This is the cutest ever!! 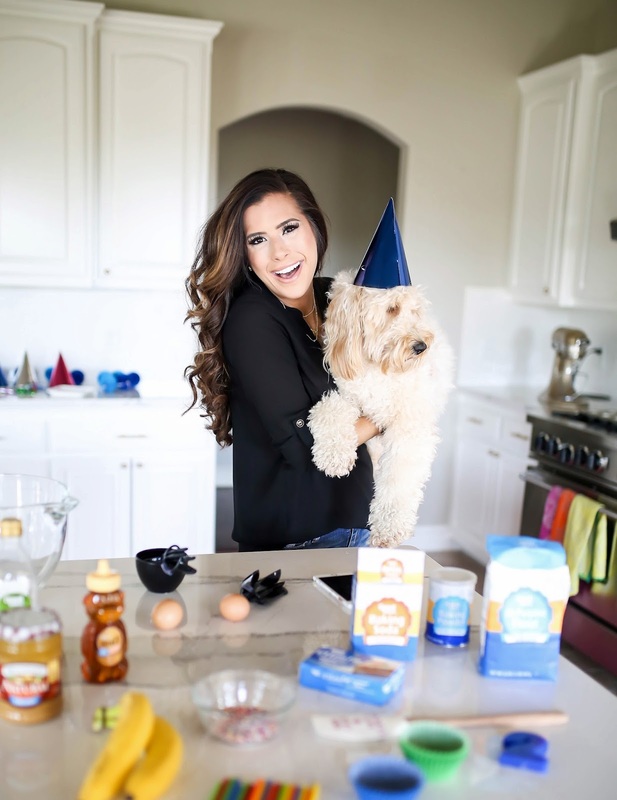 My pup's bday is coming up soon, I think I'll make her some homemade cupcakes too! So adorable, I love watching your snaps of Fitz too!